Generally, Windows 7 stores a maximum of 10 jump list entries for a program in the taskbar. Many users however would gladly have more entries for quick access to their files. You can determine the number of entries as per your taste. If the list entries are disturbing, you can even restrict them to fewer entries. The appropriate setting for this is hidden in the options of the Start menu. First right-click on the Start button and select the context command ‘Properties’. In the Tab ’Start menu’ click on ‘ Customize’. 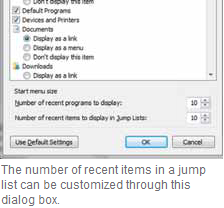 In the input box ‘Number of items to be displayed in jump lists’ elements enter the desired number, for example ‘15’. Confirm the open dialogs with ’OK’.